Be the first to hear about their new releases and deals. Download the Booksprout app and search for Juliette Douglas today! Juliette Douglas is a new voice in the western genre. Her fast-paced hard hitting stories about strong, bold and brassy women in the old west are a winning combination for her readers. 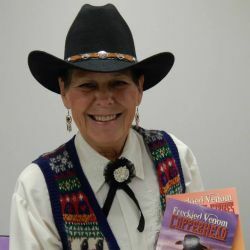 Men, women and teens alike enjoy traveling back in time eating dust, shivering in the cold, sitting around a campfire sipping coffee telling tales or riding the trail with her characters. She paints a vivid palette of landscape, hard times, true friends, quirky characters and happy endings. An award winning author, Juliette hails from Kentucky where she lives on an old farm she has named Froggy Flats Farm...cause it's flatter then a pancake and has tons of frogs in the pond! She's a rescue Mom with 2 dogs, 3 cats and 2 possums, who will be featured in a children's book coming this summer. or my website: http://juliettedouglas2016.wix.com/mysite for updates and events. Oh...Lordy! The Old West Ain't Dead...Yet!